Wow, this book was fantastic! In the dystopia genre, I already love The Hunger Games, Divergent, and Matched. I now have another book to add to my LOVE list. This was a fantastic book! Lauren Oliver is an incredibly gifted writer. The characters are so believable and so well-written- I am very impressed! I know there have been comparisons about this book and Matched. It is true that they do have similarities, both have societies where love is minimal and your life is laid out for you. They both have a main character that rebels from that idea. However, both authors do a great job of keeping the storyline fresh. 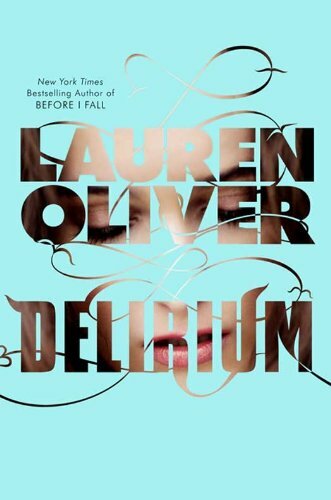 While reading Delirium, I never thought about Matched. I was so engrossed in the story that I didn't really compare it to any book. It really was that good. I really hope you will go pick up this book- it is absolutely worth it. The only thing that makes me sad- I have to wait until next March to read the second book in this three book series. So sad.